Azuri Technologies, provider of affordable pay-as-you-go solar technology, has unveiled its new 32-inch solar satellite TV system, specially designed and customised for off-grid customers in Africa. The 32-inch AzuriTV will initially be launched in Kenya at only KSh 129 per day. The company plans to launch the new TV in other markets across Sub-Saharan Africa later in the year. “Azuri’s vision is one that sees a level playing field where all consumers have the ability to benefit from modern products and services, regardless of where they live,” says Simon Bransfield-Garth. “Solar TV provides a range of important social benefits including access to news and information and unprecedented connectivity for people without access to power,” he adds. 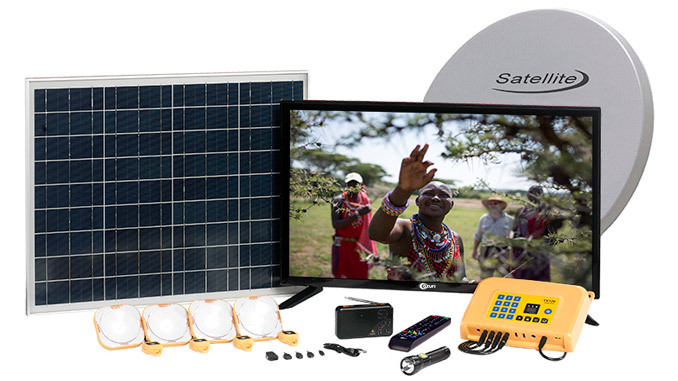 Azuri’s pay-as-you-go solar lighting and TV products require customers to make small weekly payments via mobile money to unlock the system’s power. Using this easy payment service, customers can access a wide range of modern digital capabilities and services including micro-insurance and media content.